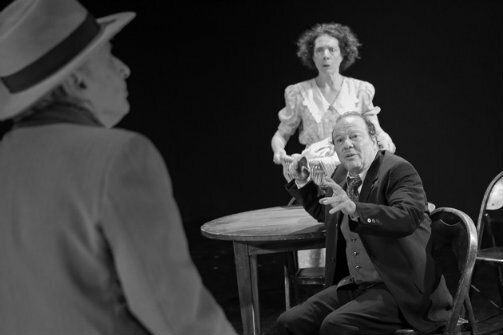 BOTTOM LINE: A strong revival of Arthur Miller’s masterpiece, performed in Yiddish. You may have seen a production of Arthur Miller’s Death of a Salesman, but have you ever seen it in Yiddish? “Why would I want to do that?” I hear you cry. It’s not as random as it sounds. Arthur Miller is of course one of America’s most beloved playwrights, and since the entire nation claims him as their own, I am reluctant to label him a Jewish-American playwright. But the fact remains that he was Jewish—culturally, more than religiously—and much of the cadence, rhythms and general zeitgeist of Salesman, are discernibly Jewish. This was made abundantly clear when Dustin Hoffman offered his interpretation of Willy Loman in 1984. Not so much with Lee J. Cobb and Brian Dennehy in the role. But it’s no surprise that the play’s Jewish undertones are brought out even more in Yiddish. Toyt fun a Salesman follows the tragic demise of aging salesman, Willy Loman (Avi Hoffman), dramatic literature’s premiere, common-man tragic hero. The character flies in the face of Aristotle’s definition of what a tragic hero ought to be, which was Miller’s way of democratizing the classic archetype and insisting that the average man is just as worthy of attention. The play chronicles Willy’s final failures that rob him of his last remnants of dignity, including the destruction of his relationship with his son Biff (Daniel Kahn) and the loss of his moribund job. Hoffman leads an excellent company of actors. Moshe Yassur’s direction is impressive, particularly because he doesn’t give himself much furniture to work with. The entire play is staged using only a table and four chairs, and yet Yassur finds a way to use every last inch of the stage, creating telling and stunning stage pictures, and allowing the characters in Willy’s deteriorating mind to enter unexpectedly and disappear through the aisles surrounding the audience. The most clever aspect of the production, ironically, is in its use of English. Scenes involving characters far removed from the Loman family—like Willy’s mistress, for example—are performed in English. The Yiddish unites the Lomans and gives them a strong sense of family, while the English disrupts that unity and makes Willy’s mistress seem like an intruder. This makes Willy’s betrayal of his wife and sons even more devastating. English is also used in a charming way in the scenes between Biff and his younger brother, Happy (Lev Herskovitz). Here, the English makes them feel like the assimilated sons of an immigrant family who are more integrated and comfortable in American culture than their parents. This evokes the narrative of Jewish immigration and makes the play feel even more American. Hoffman leads an excellent company of actors who are not only delving deep into the soul of Miller's masterpiece, they are doing so in Yiddish. To any actors who had to first learn the language before they could memorize their copious lines, I say "Oy gevalt!" The use of Yiddish in this production is not just a gimmick, but enhances the storytelling in beautiful and clever ways. If you’ve seen Death of a Salesman before, this production will offer a unique viewpoint, and will allow you to rediscover this classic play in an interesting way. If you speak Yiddish, I imagine this production will only be more poignant and moving for you. For those of you don't speak Yiddish, like myself, fear not. English super-titles are provided.